The world of insurance is changing rapidly. In our industry we talk about the insurance cycle. 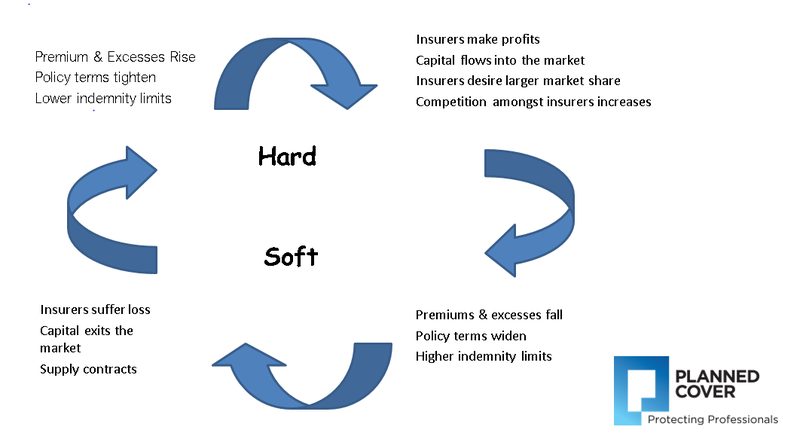 As you can see from the below diagram we talk in terms of a “hard” or a “soft” market. Then over time with high profits, more competition comes into the market, more insurers want to write professional indemnity, new players come in to the market, and some insurers who have previously pulled out of professional indemnity insurance come back into the market. When I started in the insurance broking industry in 2006 the market was coming off a hard market in the years following the collapse of HIH Insurance back in 2001. Traditional wisdom says the market moves between cycles every 10 years or so, but this soft market has continued for about 12 years. We are however seeing signs that the market is starting to harden. The biggest factor is nature and more particularly the weather. This drives the world insurance market and affects your business. As you can see the biggest catastrophes are in the US and the old saying is that when the winds blow in America they are felt around the world. Natural catastrophes pushed Lloyd’s of London to a 2017 pre-tax loss of £2 billion ($2.80 billion). The world’s largest specialist insurance market was pushed into the red for the first time in six years after a record year for losses from these natural disasters. This was despite gross written premiums rising from £29.9 billion to £33.6 billion. These claims are not just in catastrophes they are also in the construction industry and we are also seeing the rise of cladding claims and impact that is having on insurance. Whilst businesses may not be insured with Lloyd’s, since it is the largest insurance market in the world what happens at Lloyd’s affects your business. We are seeing a number of syndicates or insurers at Lloyd’s pulling out of PI insurance and in particular pulling out of Australian PI insurance. Given all these factors insurers globally are looking to increase premiums for professional indemnity insurance and all business lines. We understand that not many people love paperwork, however, with the hardening market and new exclusions being applied it is more important than ever to give the renewal process the attention it needs. We recommend completing your proposal form promptly so we have as much time as possible to negotiate with insurers on your behalf.